Awake and Dressed is a motto for my life. I’m not someone who likes to faff about in the morning, lying in bed. I have to be up and about fairly quickly, otherwise the day’s not worth counting. My Old Dutch (£29.99) is the sort of design typical of Awake and Dressed. It’s becoming increasingly fashionable, and (I mean this as a compliment rather than an insult) is the sort of thing you’d see in a branch of Triple S, or in a club on a weekend. The design’s pretty great – and you’ve got to hand it to Jonny Wolf, because the whole thing is deliciously packaged. 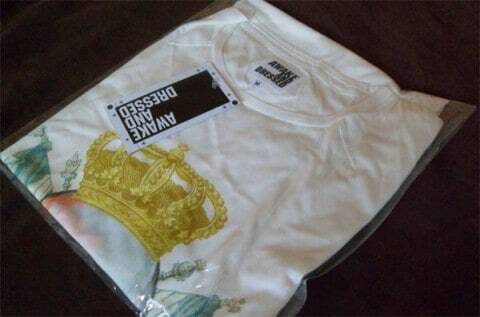 The print quality of the design is razor sharp, and has blended in with the shirt fabric brilliantly. This isn’t one of those designs that feels like it’s slathered on the shirt and is so thick that it artificially shapes it in perfect straight angles. The whole shirt is supple and giving. In fact, it’s the shirt quality I want to talk about. I’ve got a lot of tees in my cupboard, and this one is – to my mind – the smoothest wear I’ve had. It’s so soft! I haven’t been able to put it to the test with several washes to see if that changes things, but certainly on first wear it’s like a second skin. Really, the only thing I can fault is the price – at nearly £30 it’s a little steep for my tastes, but then again maybe I’m just thrifty. Plus when you wear it you begin to realise that you’re paying for a premium product, not just an overinflated price tag. These are the sort of t-shirts that people want to be seen in these days; they’re very fashionable. And I haven’t seen many brands doing it better than Awake and Dressed. 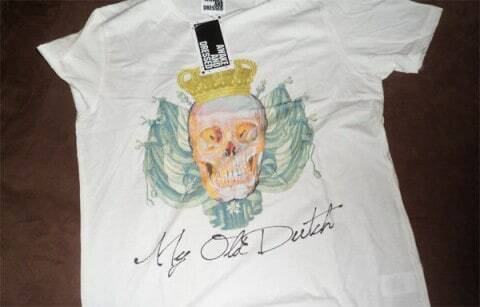 Gotta love a good ol skull T. I don’t think you are being thrifty as I agree on £30 being a tad expensive. Wait, come to think of it I am thrifty. Next post: Dusty Paw Supports Movember!